Stephen Amell, the Canadian actor famous for portraying the role of Green Arrow or Oliver Queen in the television series Arrow, not just looks like a superhero on TV but also is ripped in real life. He believes in parkour and bodyweight training and is always willing to increase the intensity of his workout regimen. The 37-year-old actor from Toronto is a proponent of holistic training which involves strengthening your mind and body while improving functionality, mobility, and performance. Amell admitted in an interview that he trains 7 days a week with an alternate day reserved for recovery. There is always some change in his training regimen and it is the variety that keeps things challenging. His exercise routine also involves full-body strength training and lots of pre-workout activities including myofascial release using a foam roller and light aerobic warm-ups. To improve his fitness and strength, he has also joined parkour classes. Here is a training schedule that mimics Amell’s workout routine. 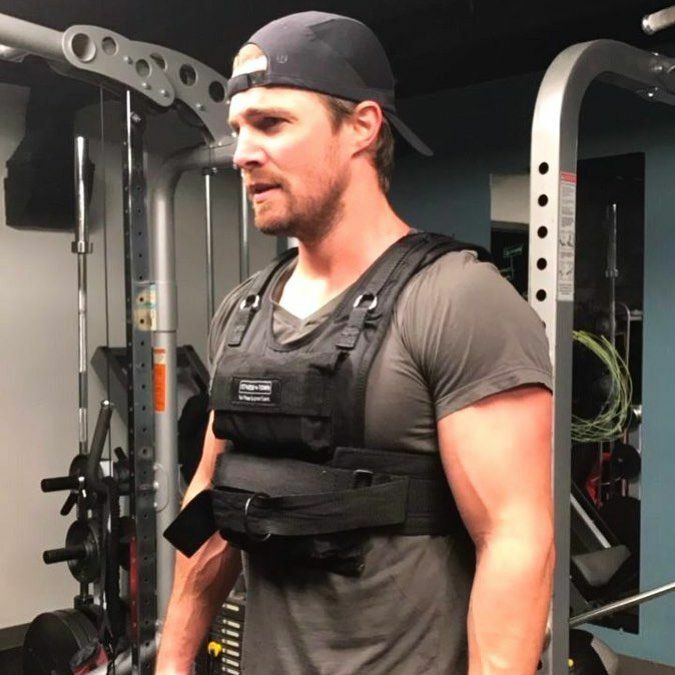 Like any other celebrity transformations, Stephen Amell’s muscle-building workout regimen is incomplete without a nutritious diet plan. He focused on eating foods rich in healthy fats and protein. He cut down his carbohydrate intake to not just become slim but also to let the healthy fats give enough energy for his intense training sessions. Amell also excluded gluten, processed sugar, beer, and dairy products from his diet. He paid attention to having 0.7-1 g of protein for each pound of his body weight, obtaining it from food sources like eggs, beans, meat, fish, and whey protein supplement. He got about 20% of the calories from fat sources including avocado, coconut oil, steak, and egg yolk.